Spectracom has introduced a new eight-channel GPS constellation simulator, the Pendulum GSG-54. Designed to provide a wide-range of capabilities for in-line production testing of devices integrating GPS receivers, according to the company, the simulator features ease-of-operation, fast test cycles, and versatility in supporting the integration of GPS receivers into devices under development. The unit’s bench-top chassis is designed to be compact, portable, and easy to set up. The Pendulum GSG-54 simulates the satellite signals detected by a GPS receiver. Built-in standards-based test scenarios can be initiated or modified on the fly from the front panel interface. It also supports a variety of connectivity options to control and reconfigure test parameters. The company says the GSG-54 GPS builds on the features of Spectracom’s GSG-L1 single-channel GPS signal generator and is designed to simulate eight different satellite signals to test position accuracy, sensitivity to loss of satellite signals, timing accuracy, and dynamic range. It can simulate movements and user trajectories, multipath scenarios, and various other atmospheric conditions. 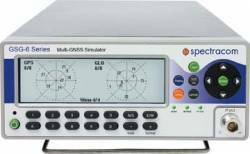 Spectracom, a company of the Orolia Group, is a global provider of time and frequency test & measurement solutions. Headquartered in Les Ulis, France, Orolia specializes in precise positioning, navigation, and timing. The company was spun off as an independent group in 2006 from Temex’s timing and synchronization activities. In a September, 2009, restructuring, Orolia merged Pendulum and Spectracom as its timing, test, and measurement product division. Through its navigation group, which includes SpectraTime and T4 Science, Orolia provides atomic clocks to various GNSS programs, including Galileo, Compass, and the Indian Regional Navigation Satellite System. In late July the company announced first-half revenues of €29.9 million (US$38.5 million) for fiscal 2010.